23.11.2015. 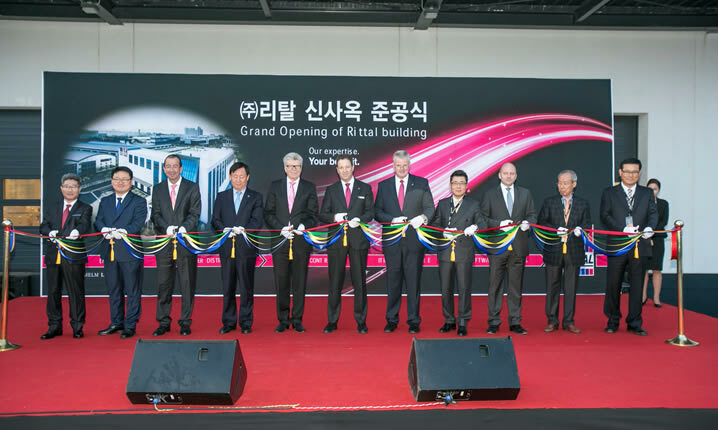 Enclosure and systems provider Rittal continues to invest in East Asia: Rittal owner and CEO, Friedhelm Loh, has now unveiled the new administration and logistics building in South Korea’s free-trade zone of Incheon Songdo. With this €10 million investment, the family-owned company is aiming to pave the way for further growth in South Korea. Eplan, a leading provider of CAE software for electrical design and – like Rittal – member of the Friedhelm Loh Group shares this new site. 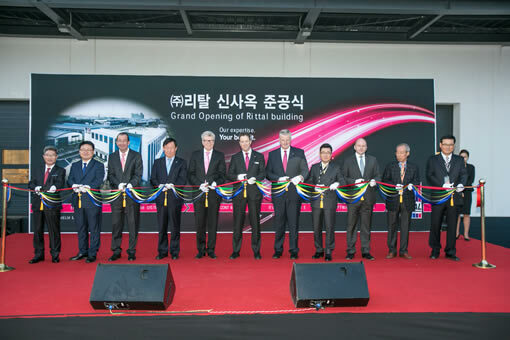 The new Rittal headquarters and logistics centre have now been ceremonially opened in downtown New Songdo City, South Korea’s metropolis of the future. More than 200 customers from industry and trade such as Kia, Hyundai, Samsung and LG attended the ribbon-cutting ceremony. Owner and CEO Friedhelm Loh cut the red ribbon in front of the building: “Anyone who is interested in what the future holds needs to fly to South Korea,” said the company’s head: “That’s why we are here. We are investing in New Songdo City to help boost the competitiveness of our Korean customers. With this investment, we are showing that we can also implement our “Faster - better – everywhere” promise worldwide. The new building will used by Rittal in conjunction with Eplan over an area of 10,000 m². It will provide space for 3,200 pallets and 110 employees. In future, however, not only the Korean headquarters will be located in New Songdo City, it will also be the site of a modern delivery centre. There is also a modification centre, in which customer requests will be processed in a project-related way. Customer care and training are also covered. South Korea has now become Asia’s third largest market for German companies. Around 80% of all automobiles exported to South Korea come from Germany. The South Korean auto and electrical industries in particular, as well as steel and shipbuilding, are strong forces in the world economy. Friedhelm Loh added: “We are already very well positioned in these industries – and intend to increase this advantage even further”. The new building’s architects have paid special attention to energy efficiency: In addition to good thermal insulation, energy-saving water cooling from Rittal is used, while the technology for the power supply in the building is also from us. “We are not only using Rittal technology to cut operating costs and up-front investment,” says Martin Rotermund, Managing Director of Rittal Korea. “Instead, we want to show our customers the benefits of our products during running operation. Our new building is thus a huge showroom for visitors. The new infrastructure is perfectly adapted to the internal processes and to customer requirements. It will enable Rittal to serve its clients better and even more quickly. And the 15-metre-high warehouse, with over 3,200 pallet positions, will make a major contribution toward this goal”, he adds. Rittal’s new administration and logistics building in South Korea is located in Incheon, around 50 kilometres southwest of Seoul. A city of the future is evolving in one of the world’s largest metropolitan areas in the form of New Songdo City with its international business park. This is incorporated in the Incheon Free Economic Zone (IFEZ). The premises at the new site will also be used by Eplan, Eplan is a leading provider of engineering services for industry and, like Rittal, a member of the Friedhelm Loh Group. This way, the synergies between the two companies can be utilised optimally in South Korea. Since the founding of Rittal’s South Korean subsidiary in 1996, the company can look back on very successful growth. Image 1: Friedhelm Loh together with his colleagues from Rittal and Eplan opened the Korean Headquarters of Rittal in New Songdo City. Rittal customers can experience the advantages of the products while production processes are running in the completely new building complex.